- The advertisement (TV commercial) of Baleno says "made of metal" while it does not look to be because of the kerb weight of the car. - If Baleno is "made of metal"; what is there in the other products of MSIL. - MSIL has started giving importance to passive safety features, yet even their latest offerings are still so light weight, that it makes me sceptical of the structural strength of the car (I do agree, that only weight cannot confirm of structural strength, still it puts doubts). It's 'Made of Mettle' and not metal. Kudos for the review! Much awaited one. I have booked one and I'm in one of those long waiting list to get hands on. Though there are many little things which maruti never can upgrade on (like the ugly power window switches to the same old boxy lights). Nevertheless our Maruti has certainly stepped up in terms of design and product. Also, the car seems like another blockbuster from Maruti Suzuki. 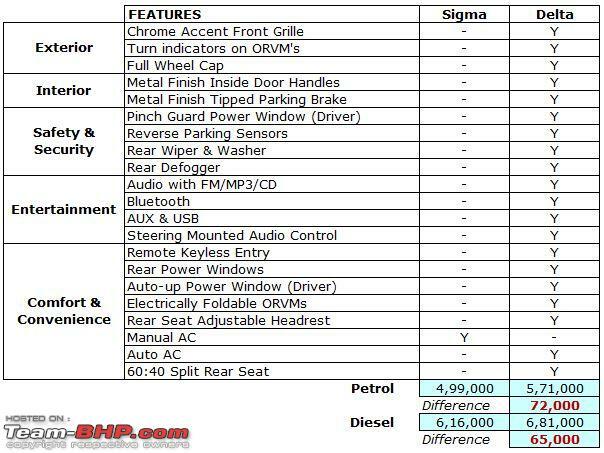 Kudos to Maruti for providing ABS & Airbags as standard and rear wash & wipe on all variants except base variant. (I personally feel that rear wash and wipe is also a safety feature). Hyundai needs to up their game now, especially on the safety front. God bless competition. With 3 great products (Baleno, i20 & Jazz) in the premium hatchback space now, other manufacturers like VW, Fiat, Tata and Toyota will have a tough time moving their products from the showrooms. Thanks for the superb and detailed review of the Baleno. Given that India is the only market where this car is on sale, this has got to be the 'only' extensive review of the Baleno worldwide. Kudos! Coming back to the car, it is an excellent all-rounder and gives thousands of Maruti customers an option to upgrade from the Celerios, Ritzs and Swifts. I'm sure the Baleno will zoom past the Elite i20 in the sales charts very soon. That said, I've driven the Elite i20 extensively, the Jazz considerably and had a short yet sweet stint in the Baleno. In my opinion, the i20 is the best diesel premium hatchback on sale while the Baleno takes the top spot amongst the petrol offerings. It is the Jazz that feels left out here, thanks to Honda's 'premium' pricing and 'not so premium' build quality. Cross posting from the Indian Car Scene Baleno thread for reader's benefit. Mods, please delete if required. Variant wise features taken from Baleno Brochure on Nexa website. 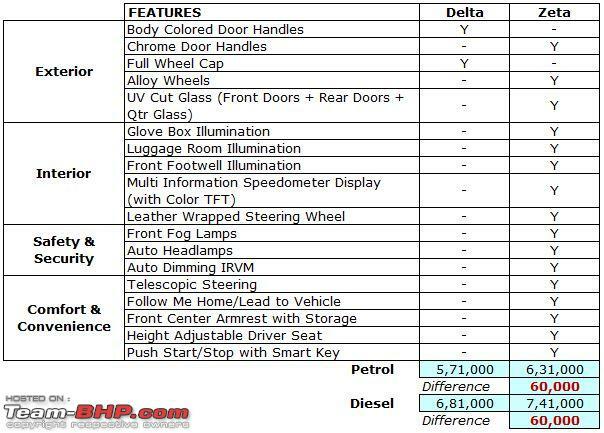 There are no feature differences between Petrol and their Diesel counterparts. 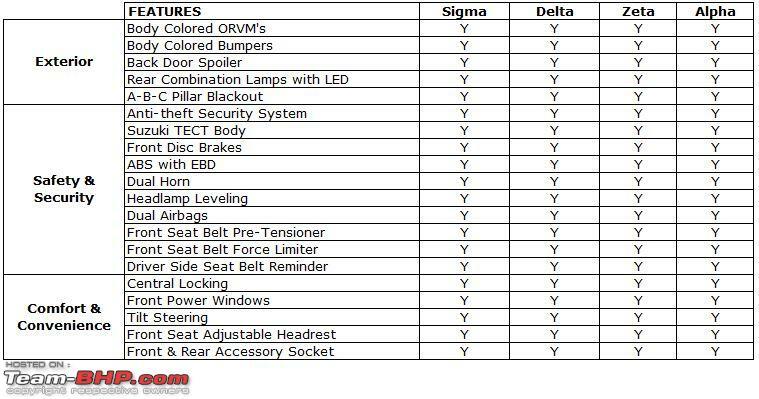 There are no feature differences between Delta MT and Delta AT. Previous post at the following link. - The advertisement (TV commercial) of Baleno says "made of metal"
Great review, well worth the wait! Again, thanks to the Baleno's lighter kerb weight, it has a power to weight ratio of 77 BHP / ton which is comparable to the Elite i20. Another upside of the lighter kerb weight: Imagine how Baleno would perform with 1.6 DDiS plonked under the hood? Additionally, the Baleno's turning radius of 4.9 meters will make those U-turns easier than the Jazz (5.1 m) & Elite i20 (5.2 m). As an Elite owner, I would say that city driving would be far more comfortable affair in Baleno just due to this difference. Prospective buyers in this segment, dwell on this factor a bit longer during test drives. Brilliant Review, guys! I remember seeing pictures of the lower variants of the Baleno which comes without the projectors & no chrome on the grille, maybe you should include those in the review as well. The lesser variants in certain colours look quite ordinary! What owners will dislike though is Maruti skimping on NVH materials. I reiterate, the diesel's clatter & high rpm sound are more audible than what you'd expect in a modern hatchback. Is it worse than the Dzire? NVH is quite acceptable in my Dzire Ldi compared to the noisy Amaze i-Dtec that i have! I did find the brake pedal to be spongy and wish that it provided more initial bite. ABS is standard on all variants of the Baleno. This is a welcome move as the non-ABS variants of the Swift & Dzire are known for their poor braking ability. One thing here: i20 is not just 17k, it is almost 35k costlier than baleno. Or, am I missing anything? He is quoting the OTR prices in Bombay. I am sure there could be an increase or decrease in the gap based on the city you check. Good Review Aditya. Rated it 5 stars. Is that a cut (red highlighted) in the seat? 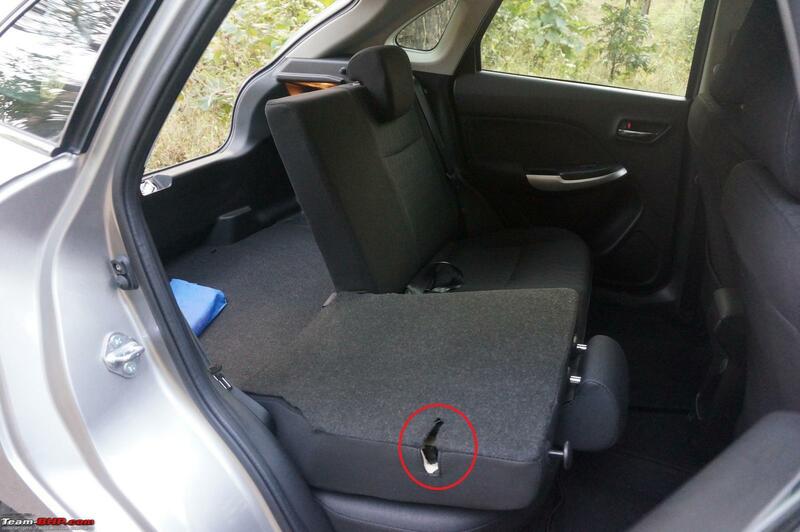 Is that a feature (whats the use) or some damage done to the seat? Came across this video on YouTube while searching for latest videos for Baleno. 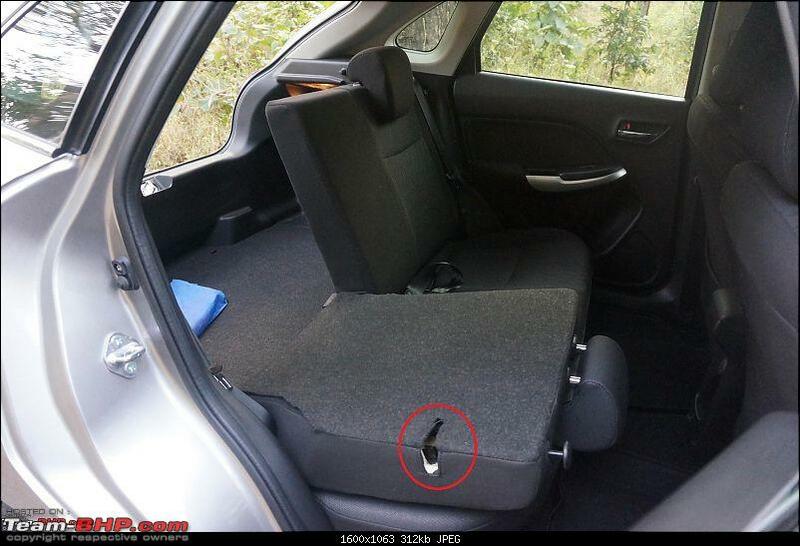 The description says that it is a Nov. 2015 Diesel Alpha model and the brake pedal has broken. What could have gone wrong considering the design of the brake pedal has to be robust? Imagine this taking place while the vehicle was in motion at a high speed. Last edited by SRK : 9th December 2015 at 22:48. Very nice review . If you can give a frank reply GTO. Between the current JAZZ and the BALENO (Ignoring the price) which would you say is a better pick for the petrol motor for Manual as well as Automatic. fantastic reviews to say the least. I went through each of the points mentioned by you and I was constantly comparing with my experience so far and it has matched in every point so far. Given the fall in fuel prices, diesel car sales have taken a backseat, and I feel that Baleno petrol will rule the market. The only reason Baleno has been able to deliver 9k odd sales I feel is due to the limited reach of the Nexa platform, else it would have scorched ahead to 15k plus figures if MSIL would have launched it through its normal network. Given, Suzuki will export Baleno to over 100 countries from India, and it has already received a stellar opening in India, I am not sure how Suzuki will manage it going forward. Not sure why we don't consider the compact sedans as competitors for bigger hatchbacks. I'm upgrading my A-star in January and the prime contenders are Hyundai Xcent and Maruti Baleno.